For many years, rats have been a nuisance to humans. These little pesky creatures are very destructive as they can gnaw many things in the house such as documents and food. Apart from destroying property, rats are also carriers of various diseases such as Hantavirus pulmonary syndrome and bubonic plague. If you’re undergoing a rat infestation at the moment, we are sorry for you. But there is no need to panic as there are various rat baits that can be used to eliminate the rat population in your home. Just be patient and figure out the best rat bait for your type of rats. Since rats are neophobic, you need to introduce the bait without poison so that they can get used to it and later introduce one with poison. This way, they won’t stay clear of the bait chunks or pellets. Also, before you buy any types of bait, you need to know what types of rats are within your compound or home. The most common rats in the USA are Norway rats and roof rats. Norway rats are common at or below ground levels such as in basements, dumpsters, burrows, and sewers. While roof rats can be found in higher areas like in attics, trees, cliffs, and in higher levels of the house. Norway rats love foods that are high in protein, sugar, and fat. On other hand, Roof rats prefer food that is rich in fruit and nuts. But if you don’t know how to differentiate different rats, you can just go with peanut butter and dried fruits which rats and rodents love. Choosing the best rat bait is not an easy thing. There are lots of brands and types of baits to select from. In this review, we conducted a thorough research and picked out the best 10 rat baits. These are very attractive to the rats and other rodents. Farnam Just one bite II bait chunks is one of the most reliable and effective rat killers on the market. The bait is very potent as it features a bromadiolone, which is very powerful and kills in just one feed. Also, you don’t have to worry about insects destroying the bait as it is treated with S-methoprene. So, it is very ideal to place outside your house to kill the pesky rodents in the yard. Additionally, Farnam just one bite II bait chunks is suitable for killing different types if rats with warfarin resistant rats included. Motomco is a famous brand and it creates some of the best rat killers on the market. The Motomco Jaguar mouse and rat bait is highly effective as it contains brodifacoum, which is a second generation anticoagulant. This means that just one feed is enough to suffocate the rat or mouse to death. 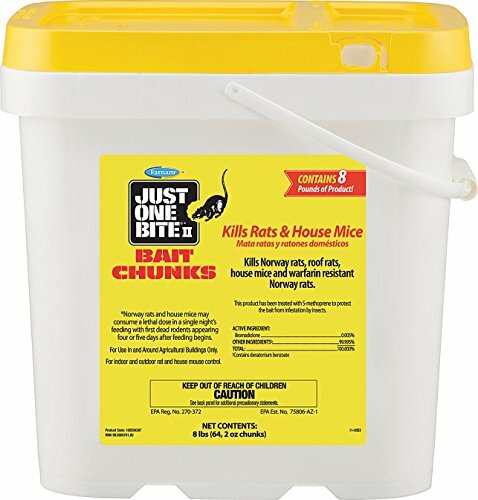 The 9-pound bucket will help you clear the entire rat or mice infestation in your home. 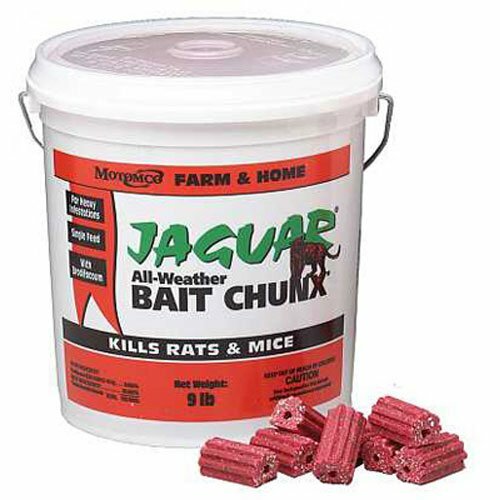 For the bait to be effective, ensure that you supply enough chunks in the area so that most of the rats and mice can have a taste of it. Don’t touch the chunks with your bare hands as the rats won’t feed on them. 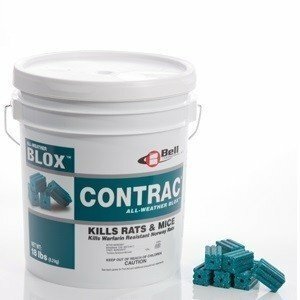 The Contract Blox bait is a multi-edged, single feeding rat and mouse bait. It contains bromadiolone as the active ingredient. This is able to suffocate the rats or mice to death some few days after feeding on it. Additionally, it features a blend of food-grade ingredients and low wax to yield attractive bait to rats and mice. The all-weather bait can as well be placed outside the house but functions perfectly indoors. Put the bait away from your pets and kids as it is dangerous. It is recommended that you place the baits in bait stations where pets and other animals can’t access the bait. If the bait stays for 40 to 60 days without being consumed, you should change it as it can sour. 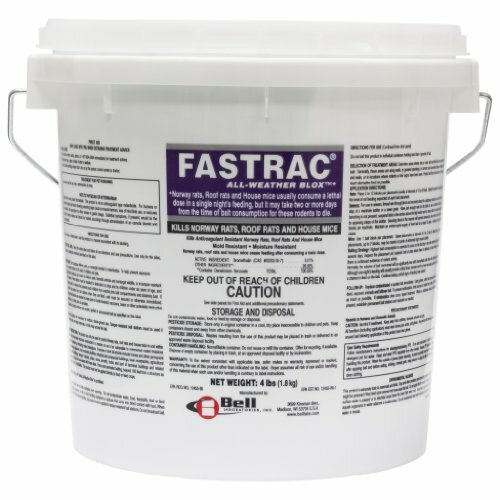 Designed by Bell laboratories, Fasttrac blox rodenticide is an extremely effective rodenticide for eliminating mice and rats in your house, agricultural buildings, food processing facilities, and in commercial areas. The rat bait contains bromethalin as the active ingredient. The bait itself features various gnawing edges and a hole through every single block. This makes putting the bait in the bait station to be easy or it can as well be used as standalone bait. The rat or mouse doesn’t have to feed twice on the bait for the effect to be felt as one feed is enough to suffocate them. Since 1932, JT Eaton has been manufacturing and selling only the highest quality products. The company’s mission is to get rid of pests in homes and in commercial places so that people can have peace of mind. The JT Eaton 166004 is an excellent option for eliminating mice and rat problem in your home. These little pesky creatures can become a nuisance if not controlled and got rid of in time. 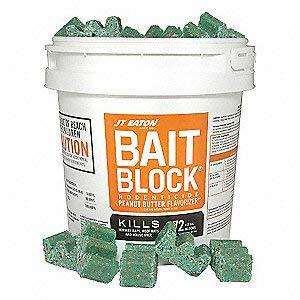 With the JT Eaton 709-N bait blocks, you will be able to eliminate them slowly by slowly. This best rat bait contains diphacinone as the active ingredient. This is a first generation anticoagulant that will kill the small rodents slowly, a few days after feeding on it. 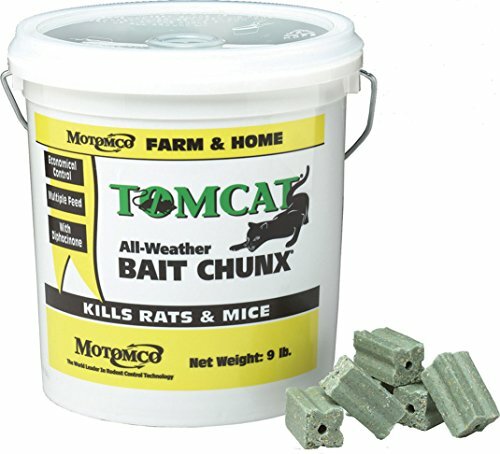 If your rats are shying away from large bait chunx, you should try out the Motomco 008-32345 rat and mouse bait pellets. Rats and mice love these pellets because they are very easy to gnaw and run away with. The Motomco bait pellets are made of diphacinone as the active ingredient. Therefore, you are required to feed them several times before the poison takes effect in them. But eventually, they will suffocate after some few days and they will start to disappear away slowly. Use these pellets inside or outside the house as they are covered with plastic. Since it comes in bulk, it will be enough to eliminate the rats and mice in your home. Just one bite is an excellent rat killer that works in just one feeding. It is a second generation rodenticide that comes with bromadiolone as the active agent. This active ingredient is extremely potent and just one bite is enough for the rat to suffocate to death. With such properties, you should use it with caution as it should not land in the hands of kids or pets. 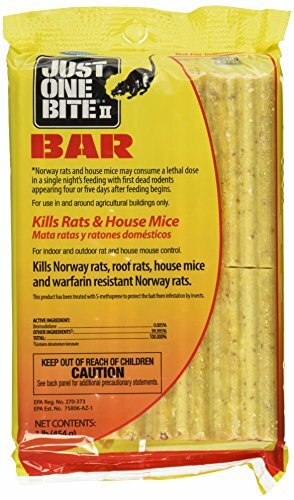 Just one bite Li bars is very ideal for eliminating a large rat or mice infestation. It doesn’t matter if its roof rats, Norway rats, Warfarin-resistant Norway rats, or house mice. It will still eliminate them. 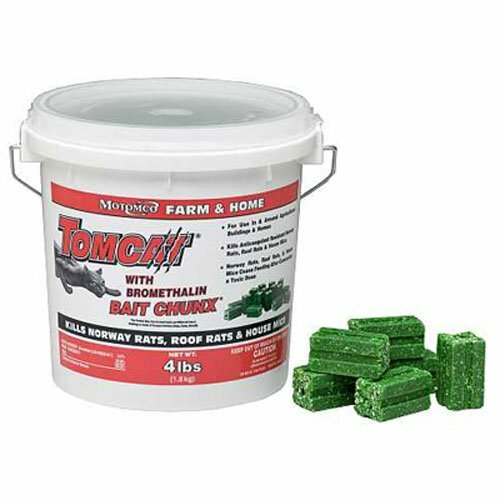 The Tomcat bait chunx with bromethalin is a great killer for different types of rodents. It is suitable for eliminating house mice, resistant Norway rats, and roof rats. The bait chunx contains bromethalin as the active ingredient. It features a hole in the chunx which allows the user to tie it around a pole or tree. The mice don’t have to feed twice on the bait as just a single feed is enough for them. The potent acute toxicant will kill the mice within two days. 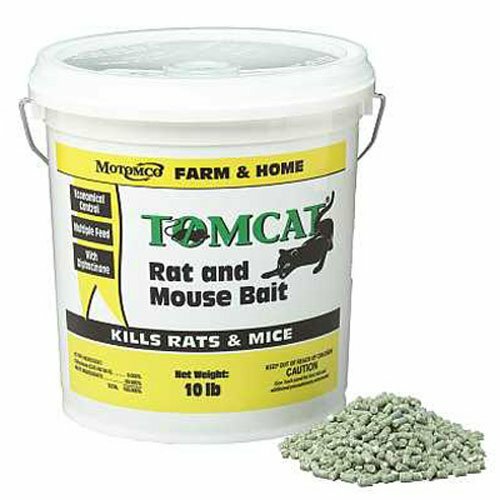 With these attributes, this bait will save you money as less bait is used to get rid of a mice or rat infestation. Made in the USA, Motomco is one of the top rat killers on the market with all kinds of products. The Motomco 9-pound bait chunx rat and mouse killer is all-weather bait. So, you can place it outside your house or inside to eliminate the rat or mouse population that is giving you sleepless nights. It comes with diphacinone as the active ingredient. This is a first generation anticoagulant and thus it is not as powerful as second generation anticoagulant. But still, it is able to eliminate rodents but after feeding on the poison continuously. If you’re fed up with mice activity in your house, get the JT Eaton 709-N rodenticide for rats and mice. This product contains diphacinone as the active ingredient. This first generation anticoagulant kills slowly but effectively. After approximately two days after feeding on the bait, the rat or mice will suffocate to death. The apple flavor added to the bait attracts rodents to the bait making it be very effective. For better results, you should supply the bait chunx is the area where there is rodent activity. If possible, you can as well tie them around trees or poles next to rodent activity. In addition, the manufacturer offers a 1-year warranty to buyers of the product. Choose best rat bait that is suitable for your type of rats. It should be effective and able to kill rats within one feeding or after a few hours of feeding on it. Also, consider picking from a notable brand with good reviews. Ensure that you keep the bait away from your kids and pets as it cannot hurt them as well. Question: How do I ensure that bait is not stolen and rat captured? Answer: Only place a small portion of the bait instead of putting a large chunk that can be easily stolen by the rodent. Putting just a small portion on the bait area will help the rodent to try and steal the bait. This will trigger the pedal and the rodent will be caught. Question: If you see droppings the color of the bait, what does this mean? Answer: This is a good sign that the rats or mice have consumed the bait and are already dead or close to death. Rats produce at least 30 droppings per day, while mice produce at least 50 droppings or more per day. So, when you see droppings the color of the bait, it is a sign that they have consumed the bait and it is working in their system. My cat accidentally eat a poisoned rat, will it die? Answer: There is a very slim chance that the cat will get sick or even die after consuming a poisoned rat or mice. This is because the poison is no longer strong as it has moved up the entire rat’s body. But still, it is not a good idea for the cat to feed on the poisoned rodent. Question: In case a rat or mice feed on pet food that is rich in vitamin K1, can these foods offset the effects of anticoagulant bait? Answer: Not at all. Actually, it will only delay their time of death. The rodent is not able to ingest enough vitamin K1 that will save it from the effects of the anticoagulant bait. Still, have a question after reading this best rat bait article? Comment below.